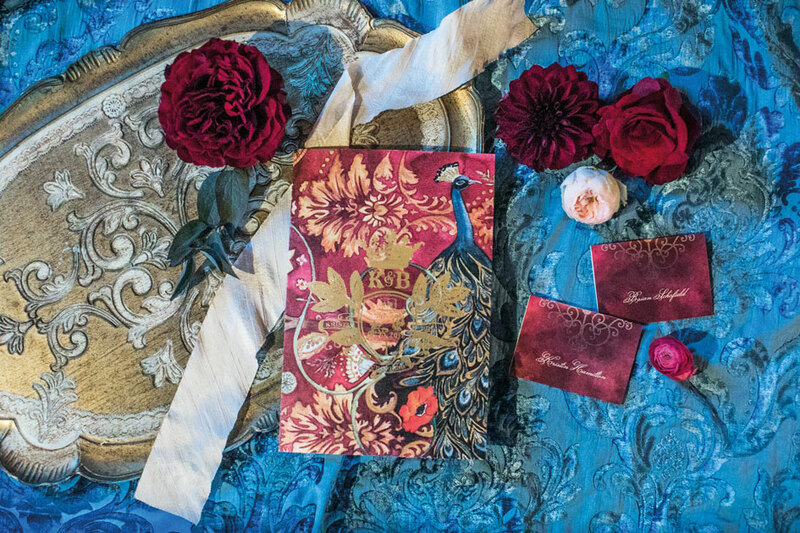 Kristin and Brian Schofield included a royal symbol in their jewel-toned nuptials at San Ysidro Ranch in Montecito. “I’ve always loved the idea of a family crest; however, it’s usually one-sided—with the groom’s last name—and has symbols from hundreds of years ago that are unrelatable to our present-day family,” explains Kristin. Designed by Ceci New York, the crest incorporated the couple’s initials, names and their wedding date. Other personal details include a cross, in a nod to their Catholic faith; a book to symbolize the story of their journey, complete with two stars representing their children; as well as their astrological signs, with Kristin, a Sagittarius, as an archer pointing an arrow at Brian’s Gemini heart. 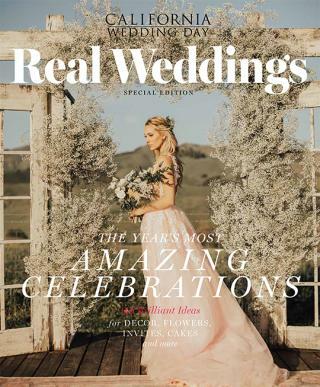 “It is important to find ways to infuse each wedding with personalized touches that are very heartfelt in nature,” explains the Schofields’ wedding planner, Rebecca Gigandet of Imagine Weddings & Special Events in Santa Barbara. 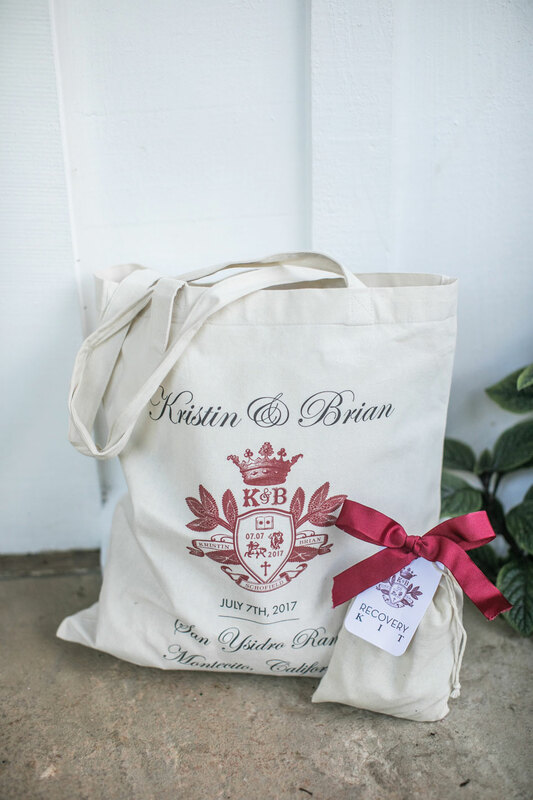 The crest became a symbolic thread through the wedding, from appearing on the cover of their church program and menu to the personalized gift bags and later, on their wedding album. Gigandet beautifully incorporated the menu into the tabletop design by placing it under a clear glass plate. The gold-crested menu was complemented by Casa de Perrin’s Versailles gold glass plate and the Chloe gold-rimmed glasses. 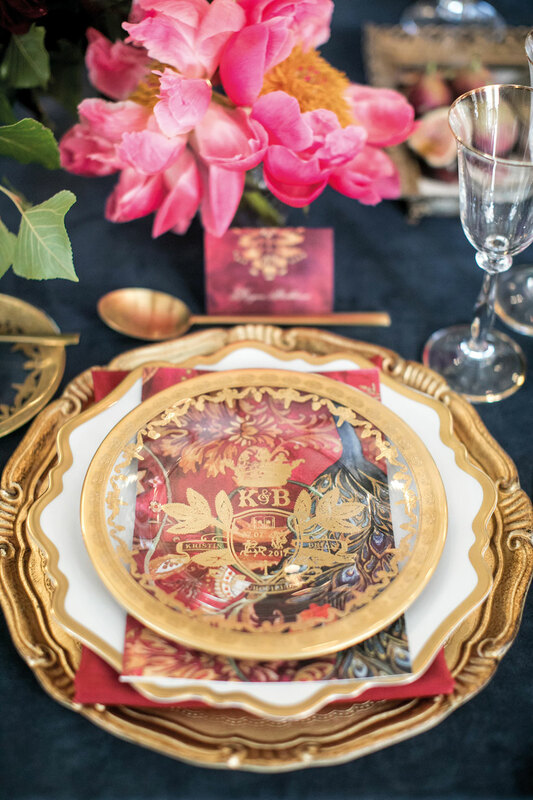 “I loved working with the vivid jewel tone color palette with the pops of gold elegance,” notes Gigandet. The bride and groom made the day their own with dazzling style and whimsical touches, from the bride’s custom lace dress and cape and gold-sequined bridesmaids’ dresses to a rented DeLorean turned photo booth and even stuffed replicas of the couple’s beloved cats. After a romantic engagement at Lake Como, Italy, Jon and Louise knew their wedding day had to be equally magical. Nicole Gillis of Nicole Alexandra Designs in Los Angeles found her inspiration for this reception table look from California’s annual music mecca, Coachella.